We make snap judgments of others based not only on their facial appearance, but also on our pre-existing beliefs about how others' personalities work, finds a new study by a team of psychology researchers. Its work, reported in the journal Proceedings of the National Academy of Sciences, underscores how we interpret others' facial features to form impressions of their personalities. "People form personality impressions from others' facial appearance within only a few hundred milliseconds," observes Jonathan Freeman, the paper's senior author and an associate professor in NYU's Department of Psychology and Center for Neural Science. "Our findings suggest that face impressions are shaped not only by a face's specific features but also by our own beliefs about personality–for instance, the cues that make a face look competent and make a face look friendly are physically more similar for those who believe competence and friendliness co-occur in other people's personalities." "Although these impressions are highly reliable, they are often quite inaccurate," Freeman adds. "And yet they are consequential, as previous research has found face impressions to predict a range of real-world outcomes, from political elections, to hiring decisions, criminal sentencing, or dating. Initial impressions of faces can bias how we interact and make critical decisions about people, and so understanding the mechanisms behind these impressions is important for developing techniques to reduce biases based on facial features that typically operate outside of awareness." The paper's other authors included Ryan Stolier, lead author of the paper and doctoral candidate in NYU's Department of Psychology, Eric Hehman of McGill University, and Matthias Keller and Mirella Walker of the University of Basel in Switzerland. We have long known that people make some personality impressions of others based merely upon their facial appearance. For instance, we see those with babyish features as agreeable and harmless and those with faces that resemble anger as dishonest and unfriendly. What's less clear is how widespread this process is and how, precisely, it transpires. In their PNAS study, the researchers explored these questions through a series of experiments, specifically seeking to determine whether our own pre-existing beliefs about how personality works affect the way we "see" it on others' faces. The experiments' 920 subjects indicated how much they believed different traits co-occur in other people's personalities. For example, they would indicate how much they believe competence co-occurs with friendliness in others. 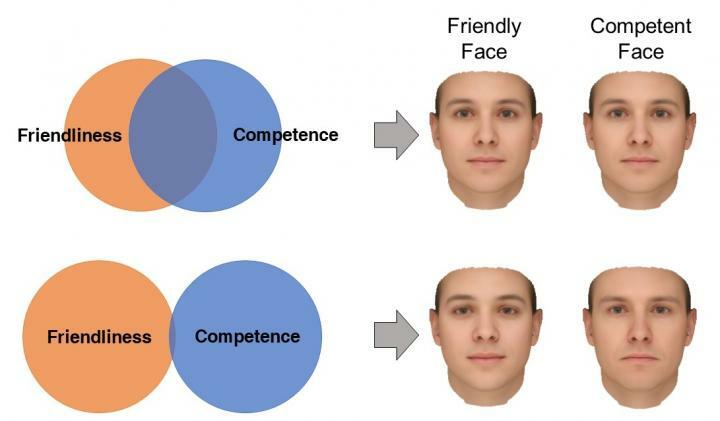 The subjects were each then shown dozens of faces on a computer screen and quickly judged those faces on competence and friendliness, allowing the researchers to see if subjects thought the same faces that are competent are also friendly–or not friendly. In all, subjects were asked about several personality traits, including the following: "agreeable," "aggressive," "assertive," "caring," "competent," "conscientious," "confident," "creative," "dominant," "egotistic," "emotionally stable," "extroverted," "intelligent," "mean," "neurotic," "open to experience," "responsible," "self-disciplined," "sociable," "trustworthy," "unhappy," and "weird." Overall, the findings confirmed what the researchers predicted. The more that subjects believed any two traits, such as competence and friendliness, co-occurs in others predicted their impressions of those two traits on faces to be more similar. In a final experiment, the researchers measured the exact facial features used to make personality impressions using a cutting-edge method that can visualize subjects' mental image of a personality trait in their mind's eye. They found that the facial features used to judge personality indeed change based upon our beliefs. For instance, people who believe competent others tend to also be friendly have mental images of what makes a face look competent and what makes a face look friendly that are physically more resembling. "Generally, the results suggest that beliefs about personality drive face impressions, such that people who believe any set of personality traits are related tend to see those traits similarly in faces," says Stolier. "This may explain how humans can make any set of impressions from a face." The results lend evidence for the researchers' perspective that most traits perceived from others' faces are not unique but merely derived from one another, with a few core traits driving the process. "For instance, while a face may not appear right away to be conscientious, it may appear to be agreeable, intelligent, and emotional–personality traits a perceiver may believe underlie creativity, resulting in them seeing a face as conscientious," adds Stolier. The results also provide an explanation for how people can make so many different impressions of someone just from a handful of features present on a face. "We may only see cues in a face that directly elicit several personality impressions, such as 'submissiveness' for those who have 'baby faces,' " observes Stolier. "However, the perceptual system may take these few impressions and add them together, such that we see a face as conscientious or religious, to the extent we think the personality judgment is related to those impressions we initially make from a face–such as agreeableness and submissiveness." The research was supported, in part, by grants from the National Institutes of Health (F31-MH114505) and the National Science Foundation (BCS-1654731).